When you’re in the mood for comfort food, you want it to taste like it’s supposed to—rich, delicious…comforting—not all “healthified” (“low fat!” “sugar free!”) and cardboard-y. Well, prepare your taste buds for the surprise of a lifetime, because we’ve come up with recipes that do the impossible: combine solid nutrition with real, decadent indulgence. 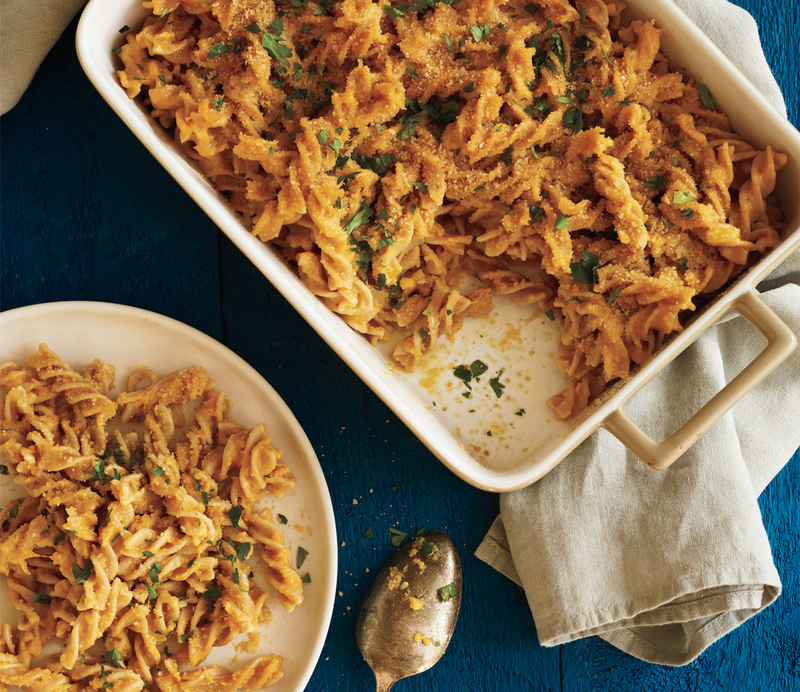 We’re talking gooey mac and cheese, crispy fish-and-chips, downright sweet brownies—all just slightly modified so you can enjoy the flavors you crave without the pounds that usually come with them. Trust us, even a health food junkie will find these dishes delectable. Because the only way you’ll stick with eating good food is if it tastes better than junk food. 1. Preheat oven to 375°F. In a bowl, combine breadcrumbs, Parmesan, pepper, and flaxseed. 2. Coat a baking pan with cooking spray and place fish on it. Sprinkle the crumb mixture evenly over the fish. Bake for 15 minutes. 3. In a bowl, combine yogurt, relish, chives, dill, mustard, lemon juice, salt, and cayenne pepper. Chill until ready to serve. 4. Place polenta pieces in a bowl and drizzle oil on top. Add Parmesan and pepper. Gently toss until polenta is coated. 5. Line a baking sheet with foil and lightly coat with cooking spray. Place the coated polenta bites on the sheet and bake for 12 minutes. 6. Divide polenta tots among plates and top each with a piece of fish; serve with a few pickles and a dollop of tartar sauce. 1. Boil pasta and cook until tender, 12 to 14 minutes. 2. Meanwhile, place a large saucepan over medium heat. Add oil, onion, amino acids, pepper, thyme, cayenne, and nutmeg. Stir until onions are translucent. 3. Add squash, stock, almond milk, and yeast and bring to a boil. Turn off heat. With a hand immersion blender, puree the sauce until smooth. Stir in cheese. 4. Strain pasta and stir it into the sauce. 5. In a saucepan over medium heat, add garlic, breadcrumbs, and parsley and cook for a minute. Serve pasta in bowls, garnished with breadcrumb mixture. 1. Preheat oven to 350°F. In a small bowl, combine cooked quinoa, thyme, chili powder, black pepper, and almond milk. Set aside. 2. In a food processor, combine onion, carrot, bell pepper, arugula, and garlic. Pulse until all are well chopped. Be careful not to overchop. 3. Transfer vegetables to a large mixing bowl and add turkey and the quinoa mixture. Add salt and egg. Gently combine. 4. Line a baking sheet with foil and lightly coat with cooking spray. Mold the meat into a rectangular shape in the center. In a bowl, mix all the glaze ingredients together and brush over meat loaf. 5. Bake meat loaf for about 45 minutes, or until the internal temperature is well done (165°F on a meat thermometer). Let stand 5 minutes before slicing. Sprinkle with parsley and serve. 1. Preheat oven to 375°F. Cut sweet potatoes lengthwise, deep enough to open them in half. Line a baking sheet with foil and place sweet potatoes flesh side down. Bake for 25 minutes. 2. Place a skillet on medium-high heat and add oil. Add turkey and break it up with a spoon. Lower heat to medium-low and cook the meat. 3. Add salsa, tomato sauce, honey, vinegar, and mustard. Season with salt, pepper, and garlic powder. Cook until the mixture thickens. 4. When potatoes are done, scrape them with a fork to loosen the skin. Place potatoes, open side up, on the plate, and scoop a heaping ladle of the turkey mixture into the centers. Garnish each plate with a sprinkle of parsley. 1. Preheat oven to 350°F. In a high-powered blender, add dates, tofu, cocoa powder, almond milk, 2 tbsp cacao nibs, vanilla, chia seeds, cayenne, and salt. Blend, periodically pausing the blender to scrape down the sides. 2. Add flour and baking powder and pulse the blender until incorporated but do not overblend. Coat a 9-by-9 baking dish with cooking spray and transfer the batter to the dish. 3. Top batter with the 1 tbsp reserved cacao nibs and almonds. Bake for 40 minutes, or until brownies are set. Let cool completely before cutting. 4. Place all cashew cream ingredients in the blender and blend. 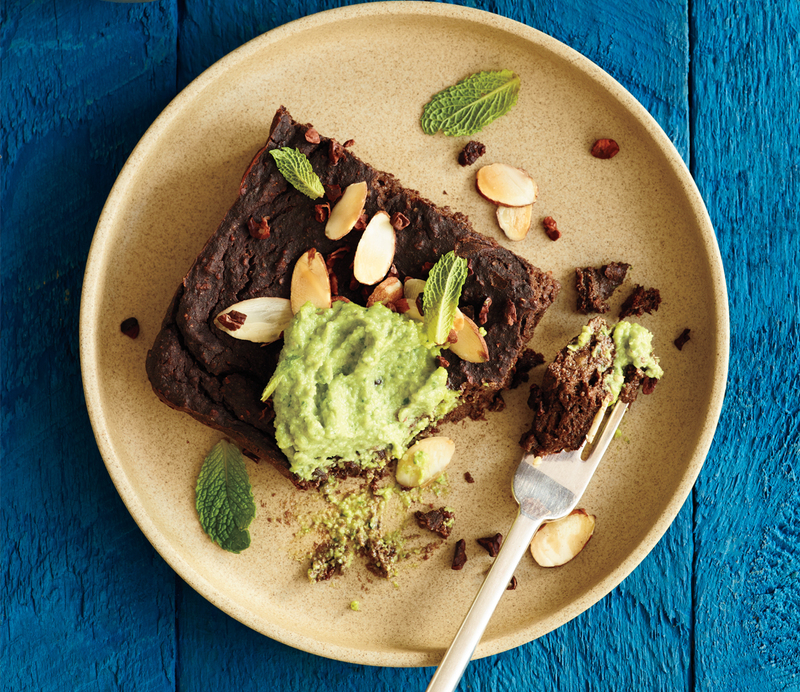 To serve, place a brownie on a plate and top with a dollop of the cashew cream. Garnish with a mint sprig, if you like.